Master of Arts in Global Governance alumna Belinda Sardiñas works for PricewaterhouseCoopers. The Master of Arts in Global Governance (MAGG) prepares students to tackle some of the world’s toughest security challenges including transnational crime, cybersecurity, human rights, surveillance and intelligence gathering, religious conflict, immigration and refugee flows, global terrorism, business risk and more. For Belinda Sardiñas MA ’15, the degree program fueled her desire for a career in civil-military relations. 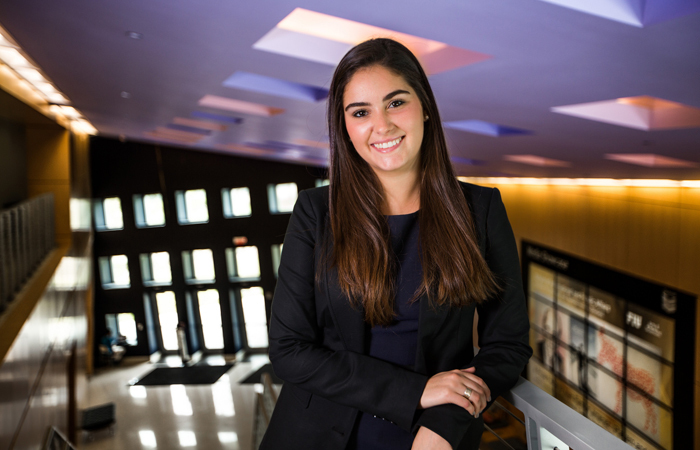 The MAGG alumna has always had an interest in international relations, but an internship at the Spanish Consulate while she was an undergrad and encouragement by Consul General Cristina Barrios led her to the innovative degree program. During her first year in the professional M.A. program, Sardiñas landed an internship in the Partnering Directorate at U.S. Southern Command in Doral, Fla. Housed in the Department of Defense, SOUTHCOM is responsible for providing contingency planning, operations and security in Latin America and the Caribbean. Prior to graduating from the program, Sardiñas had already accepted a position in the Advisory Department of PricewaterhouseCoopers, where she is currently employed. Through the MAGG program, Sardiñas and other students learn to work in a globalized world, utilizing essential critical thinking and negotiation skills that successfully translate across societies and borders. The program’s Capstone Project is an important component of the students’ learning experience and training, offering hands-on work with a professional organization or agency on a topic of policy relevance. In addition to SOUTHCOM, these include the United States Department of Agriculture, the Federal Bureau of Investigation, and the Defense Intelligence Agency, among others. Internship opportunities within MAGG also open doors for exceptional career prospects. MAGG alumna Kristy Wright secured an internship at the Senate Foreign Relations Committee in Washington, D.C. where she worked on projects related to energy and the environment. Wright helped set up hearings on candidates’ testimonials for potential honorary positions as ambassadors and helped arrange the hearing with Secretary of State John Kerry on the rebel group Islamic State of Iraq and Syria (ISIS). Wright has become a strong advocate for the environment, human rights and international law. Her internship has given her hands-on experience and the determination to make a difference in the world. The Steven J. Green School of International and Public Affairs is accepting applications for the next cohort of MAGG students. For admissions information or to sign up for upcoming information sessions, email magg@fiu.edu. Evelyn Perez contributed to this story.